Listening to online radio is one of a popular internet pass time — almost everyone and their pet 700-pound pig “Pinky” does it. V-Radio, the application in the spotlight today, is all about allowing users to enjoy radio happenings all over the world. V-Radio is an internet radio streaming application for your Windows computer. The app’s main purpose is to stream live radio stations from anywhere in the world, and whatever stations that are not available by default, can be added with just a few simple clicks of the mouse. Picking apart V-Radio has been fun; not every time one gets to be entertained by an application while reviewing it. By default there are not many radio stations available, and that can be considered as a good or bad thing, depending on who you are. Some may want everything to be available right away, while others may only want to add the stations they want to use. Personally, I would have preferred if all stations were available all at once. Adding stations is not hard by any means. Hit the Browse tab, then your country/destination of choice, and await for all stations in that area to be downloaded and ready to rock the house down to a rubble. Users can also add radio stations to Favorites; this allows one click access to all your favorite stations — no need to hit the search box to find the station you were listing to before. Users won’t have to worry about quality because, as per my tests, everything sounds really well. Sadly, there is no information about the bitrate at which a station is playing. However, you can rate a station from a scale of 1 star to 5 and such ratings help you know the quality of a station. For those interested, there is an usage statistic that tracks the stations you have listened to. Consider it more of a history than anything else. Basic functionality, but hey, it works so who is to complain? Moreover, not many users would be using it anyway. I mean, who cares about what you listened on the radio? Overall, using the app is easy. 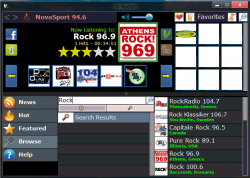 The user interface might not be the best you have ever seen in a radio app but, for what V-Radio is capable of, it works. Let’s get down to a few of the bad points of V-Radio. First off, not many popular stations are added by default; it would have been nice to have some instead of having to add them manually. (In defense of the developer, it is hard to define what a “popular” station is so I can’t really blame them for not having all the stations which I feel are popular.) In addition, .NET Framework 4 and Windows Media Player 9 or higher are required for the application, which is very annoying. Finally, there are no categories to choose from, and that is a major disappointment. One that can be overlooked by some no doubt, but for me, I wanted to hit the Rock category and begin listening to some Foo Fighters right away. V-Radio is a good radio streaming application. Its minimalistic features allows the app to focus on one thing, and one thing only — providing good entertainment on those happy days.. or those lonely nights when your cats are ignoring you. V-Radio is an app worth downloading.